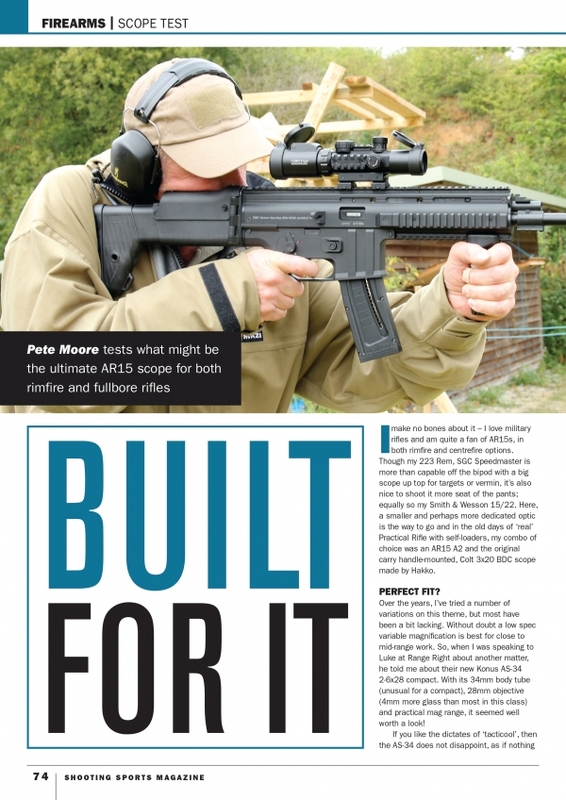 I make no bones about it - I love military rifles and am quite a fan of AR15s, in both rimfire and centrefire options. Though my 223 Rem, SGC Speedmaster is more than capable off the bipod with a big scope up top for targets or vermin, it's also nice to shoot it more seat of the pants; equally so my Smith & Wesson 15/22. Here, a smaller and perhaps more dedicated optic is the way to go and in the old days of "real" Practical Rifle with self-loaders, my combo of choice was an AR15 A2 and the original carry handle-mounted, Colt 3x20 BDC scope made by Hakko. Over the years, I've tried a number of variations on this theme, but most have been a bit lacking. Without doubt a low spec variable magnification is best for close to mid-range work. So, when I was speaking to Luke at Range Right about another matter, he told me about their new Konus AS-34 2-6x28 compact. With its 34mm body tube (unusual for a compact), 28mm objective (4mm more glass than most in this class) and practical mag range, it seemed well woth a look"
If you like the dictates of "tacticool", then the AS-34 does not disappoint, as if nothing else it's a looker! However, it also offers a surprising number of useful and novel features that have both curb and real appeal. It's compact at 8.35" long, but weighs a noticeable, but not overly heavy, 19.75oz. From the box, it's fitted with decent, flip-up lens caps and 11mm to Weaver/Picatinny reversible mounting clamp; more of that later! Here's what Konus says about it: "The Konuspro AS-34 has been constructed with quick target acquiring properties. Speed and accuracy have therefore been enhanced, whether at the range or in close quarter combat situations. A beefy outer diameter of 34mm will withstand the most extreme conditions, while an integrated tri-rail system will accept all of your accessories. Completely waterproof, this model features a dual illuminated Mil-Dot reticle and an illuminated level bubble for low light shooting. The base is reversible and will fit both the Weaver/Picatinny and .2 rails, while the field of view is especially wide for fast moving tragets"
Starting at the back, we have a fast focus system and a large eyepiece bell, at the rear is an integral level bubble, which seems a bit over the top for a low power optic such as this, but, if you need to level for a shot, it's there and not obtrusive at all! There's a 5-button, control pad on top as follows: top C (reticle colour red or blue), left + (increase illumination), right - (decrease illumination), middle OFF. Operation is seamless; just select the colour and press the + or minus button and it decreases/increase smoothly. Below this is an ON button that illuminates the level bubble; not seen that before. In front is the magnification ring, at 12 o'clock on the body, is the rotary ON/OFF control, which looks like a drum-type rheostat. In the middle is a short section of Picatinny rail with longer ones on the left and right. Finally, before the objective are the turrets, which I would therm as tiny tactical. They are quite slim at 0.870" and of the lift to unlock style. Click values are 1/4 MOA @ 100 yards with surprising 48-clicks per turn and nine full revolutions. Drums are marked in 1/4 and 1 MOA graduations. A small slot-head screw allows them to be set to zero; elevation is identical! A small silver dot on the ends of the 12 and 3 o'clock Picatinny rals act as a dialing reference point. The glass-etched reticle is in the second focal plane (SFP) and is a standard, 4-dot Mil-dot type. I doubt if may wil use it to range with, but for holdover on rim and centrefires, as well as airguns, they always work well. The ret is crisply presented and when illuminated never blows out or loses shape, even at the highest setting. Equally the colours are good and not out of register to the pattern.